It might sound gross, but insects are already eaten around the globe, and may soon be a major food-source here in the U.S. Bulging eyeballs, crunchy exoskeleton shells and wriggling slimy larvae ­— perfectly dramatized in the likes of Indiana Jones and the Temple of Doom, Survivor and Fear Factor — are illustrative of Western culture’s disgust at eating bugs. But the Burke Museum’s Bug Fest this weekend, complete with cooking demonstrations by David George Gordon, “the Bug Chef,” is one example of a growing trend to get Westerners to calm down and eat their bugs. According to the Food and Agriculture Organization of the United Nations (FAO), insects could play a role in achieving food security, reducing environmental harm linked to traditional livestock, and giving livelihood opportunities for the world’s poorest. A 200-page report released this spring by the FAO is spurring some serious talk on the issue in mainstream media. This year, the UK’s version of Marie Claire named insect eating as a foodie trend in London; Forbes declared bug eating the next culinary trend, and the Atlantic explored the contributions of previously perceived “pests” to help end world hunger. “Eating bugs is actually a kind of trendy thing right now,” said Gordon, a Seattleite, science writer and hobby chef, who first published a bug cookbook in 1998. He gave a talk along with a bug meal served on Wednesday at the Burke, and will also be at the museum’s annual Bug Blast this Sunday from 10 a.m. to 4 p.m.
Gordon suspects that Western attitudes toward bugs are subconsciously rooted in our preference for agriculture, and the perception that bugs are pests bent on destroying crops. Since his cookbook was released, he’s spoken and given cooking demos everywhere from elementary schools to food festivals in Singapore to the Smithsonian Institution. 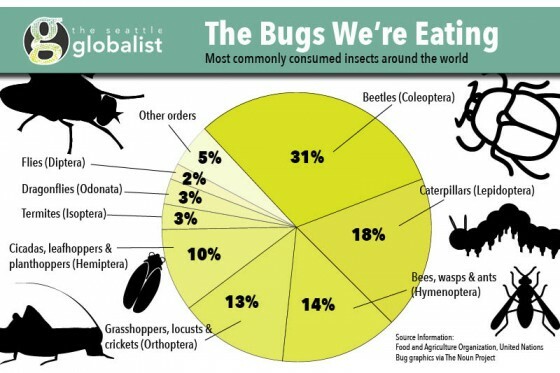 The movement for bug eating (or entomophagy, if you want to sound fancy) is growing, as evidenced by the FAO report. “I feel kind of vindicated. I was 15 years ahead of the UN on this,” said Gordon. According to the FAO, insects are a part of the traditional diet of around 2 billion people and around 1,900 species are documented as edible. Red and white maguey worms (the larvae of a moth and butterfly, respectively) are a delicacy for Mexican farmers who harvest them off the leaves of the agave plant and eat them deep fried, seasoned with a spicy salsa and rolled in a tortilla. The black weaver ant, found in subtropical China and South Asia, is processed and used as a nutritional ingredient in health tonics and foods in China. Beetle larvae are eaten in Cameroon, gathered by women who place their ears against the palm tree listening for a specific sound made by the nibbling bugs when it is the optimal time for harvesting. While many bugs are collected in the wild, the concept of farming insects for human consumption is growing. Already people in Thailand, Laos and Vietnam practice cricket farming. Closer to home, one business pushing against consumer behavior is World Entomophagy, which provides access to scientific articles, recipes and opinions from prominent proponents, as well as organic bugs available for purchase. Enviroflight is rearing insects for plant and animal feed. Sensing the tide of popularity, Gordon’s publisher encouraged him to re-release his cookbook with more recipes this year. The revised “Eat-a-bug Cookbook” is a “more eloquent version with 40 recipes including some from modern chefs,” he said. Recipes include buckwheat bug griddlecakes, cream of katydid soup, and chocolate cricket torte. The insects are prominently fixed in the visual presentation of each dish. The meal that accompanied Gordon’s talk on Wednesday was catered by University District restaurant Café Racer. 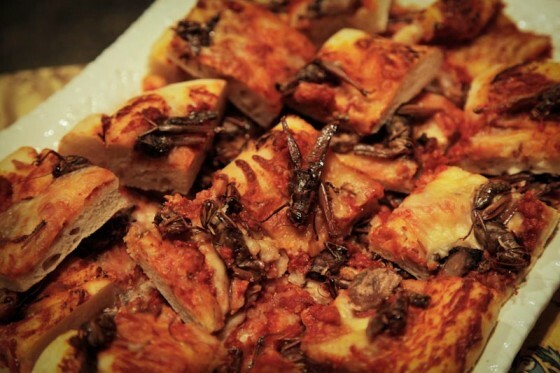 The menu included grasshopper pizza, locust kabobs, lemonade colored with bugs (“bug juice!”) and flan with waxworms. 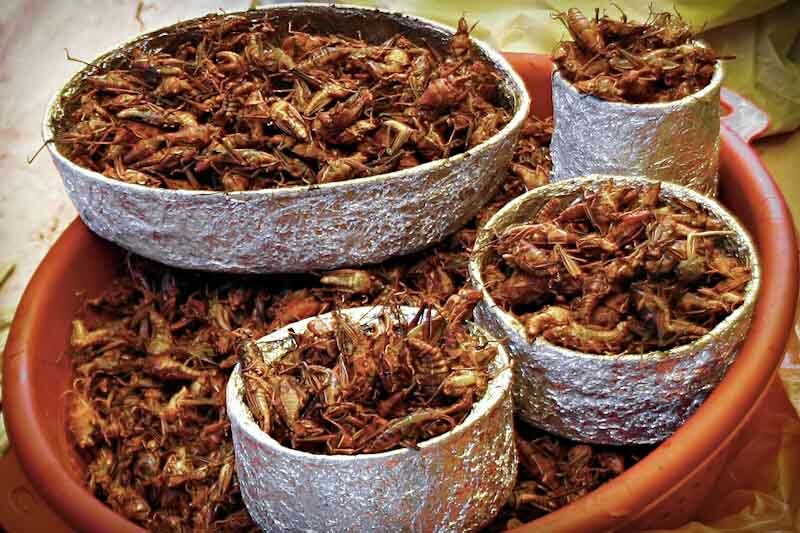 Sampling these dishes, there’s no mistaking that you’re eating bugs. But Gordon is quick to point out that this doesn’t have to be the case. Utah-based Chapul chocolate bars incorporate flour made from crickets into its dairy-free, soy-free recipe, using techniques and flavors native to the American Southwest. Gross as it might sound, in the future we’ll probably have a lot more insect-based ingredients rolled in to our food supply. And hey, do your really know what’s in your favorite hamburger? You can catch David George Gordon again at the Burke Museum’s “Bug Blast” on Sunday, September 22nd from 10 am to 4 pm and explore the “Insects and Arachnids” exhibit Saturdays and Sundays throughout September from 11 am to 3 pm. Rebecca is a journalist, wife, mother, hobby baker, and dreamer. 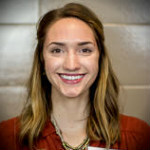 She's a graduate student of international studies at UW working on a thesis about the debate on genetically modified crop adoption in Africa. Check out her blog Humanity in the Mirror . Hi I’m really interesting in making a big eating club with my friend. I am a little nervious any advise? I’m a collage teacher from China.You can just call me Oliver. I’m studying on the rearing of Clanis bilineata larvae,an insect we call “Doudan”,which means “a spirit on soybean”.It’s unbelievable delicious and about 8,000 tons of this insect were consumed each year,according to a survey by the local government in 2005. The price raged from $100 in spring and $15 in summer. Hope you can help us to let it being known to more people and welcome to Lianyungang,Jiangsu province, China to try it.